10+ Stylish Covered Ceiling Ideas To Make It Smooth ! Covered ceiling ideas – It is always in every room in your house living room, bedroom, dining room, you name it! Yep! It is the ceiling. Unfortunately, many homeowners think that it does not deserve embellishing because hardly will people notice it. The truth is installing one of stylish covered ceiling ideas can improve the appearance of your home interior design. Covered ceiling has been widely used as a convenient way to give a facelift to the room. A wide array of ceiling materials enables you to refurbish the ceiling without compromising the style of your home interior design. If you are still looking for the most stylish covered ceiling ideas, you only need to read on this article. 1 Why Do You Have to Cover The Ceiling? Why Do You Have to Cover The Ceiling? Many homeowners install wiring, plumbing, and other utilities and they have to find where to hide them. Letting them be exposed to your guests will definitely be not a good idea. Therefore, they usually hide them on the ceiling. Some coverings like suspended ceilings allow you to hide the flaw of the ceiling as well as providing easy access when you need to fix the wire. Some other types of ceiling covers reduce acoustical noise. Unlike baseboard, wallpaper, or any other home improvement stuff, ceiling covers need a low maintenance. They will still impress your guests without needing regular replacement as long as they are still in their top-notch condition. What do you want the room to be? What color does dominate the room? Maybe those questions pop into your mind when you decide to cover the ceiling. But, if you have not made up your mind yet, these cover ceiling ideas may help you overcome this problem. Dropped ceiling can be a great choice for ceiling cover in that itprovides easy access to the actual ceiling in case there is something wrong with the piping or wiring. You will only need to lift some panels up and drop them back into their initial position when you are done. 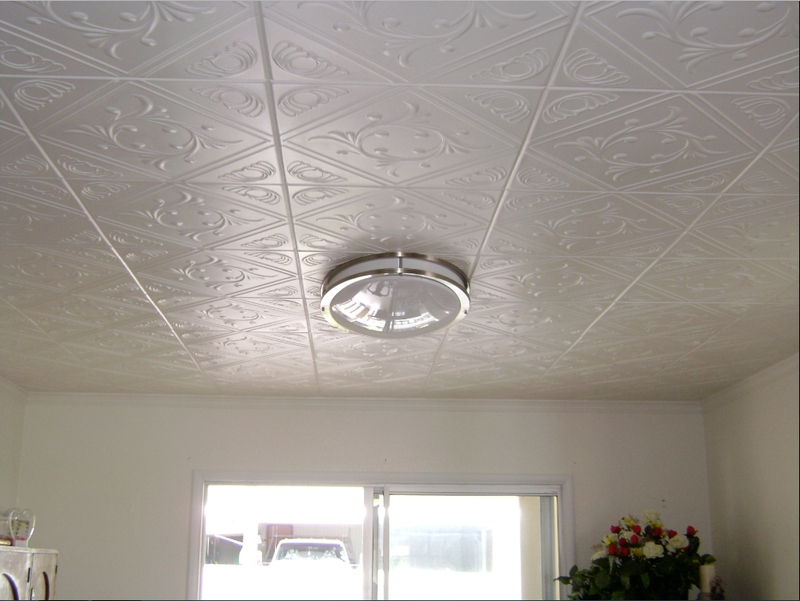 Faux tin ceiling tile is one of materials used for making dropped ceiling. These tiles provide detailed patterns embossed on the surface of every tile, creating an elegant look to the room of your house. The brass finish is suitable for victorian or steampunk style very well, but it will be a bit awkward if the tiles are installed in a modern house that tends to adore minimalist look. The distinctive patterns can draw people’s attention. You can avail yourself the exquisite patterns embossed on the tiles to get potential buyers when wanting to sell the house. You can have a nest egg because this faux tin tiles are much cheaper than the real ones. Just like any other dropped ceilings, faux tin ceilings can reduce the room space and, somehow, make the room look cramped. Faux tin ceilings are not as durable as the real ones. Dropped ceiling, also known as suspended ceiling, is not the real ceiling. It is solely an additional ceiling installed under the actual one. The name suspended ceiling denotes the way it is installed very well. Suspended ceiling comprises of several square panels supported by light metal grids which are suspended from the real ceiling located above them. These white ceiling tiles suit the green wall a lot. Well, white is a versatile color actually meaning it complements any colors. But look at those finely-carved patterns. They look like baseboard and wainscoting. Therefore, if you do install baseboard or wainscoting, these tiles will be the icing on a cake. If you are not good at do-it-yourself projects or they are not your cup of tea, installing ceiling cover will be challenging and arduous. 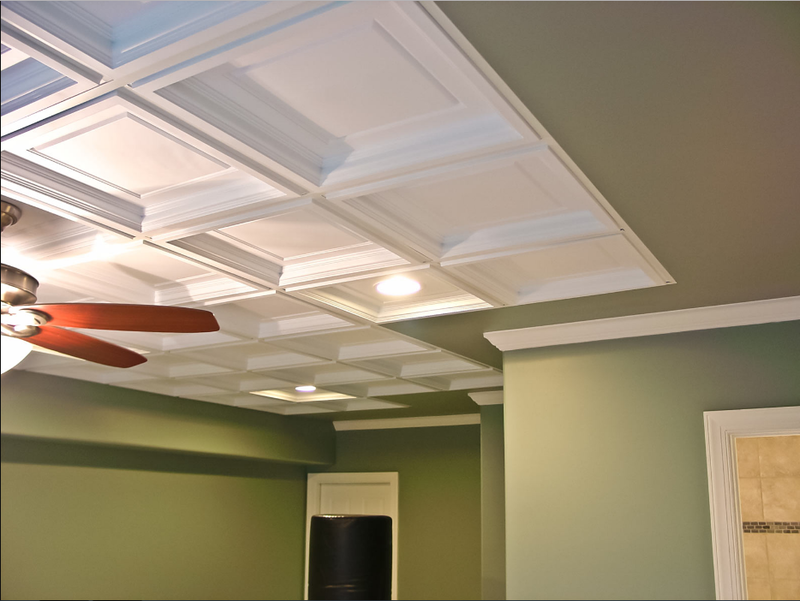 However, Styrofoam ceiling tiles enable you to install them without breaking a sweat. Your guests will be impressed and think that the ceiling was installed by a pro. This white Styrofoam ceiling was designed meticulously to picture the beautiful nature. It complements the white walls nicely. The white decorative lamp sits gracefully among the ceiling tiles and, together with the ceiling tiles, spruces the room. Foam is well known for its insulating ability. It can prevent heat from passing through so that you will stay warm during the cold seasons. No need to turn your heater on and, eventually, you can save more money. 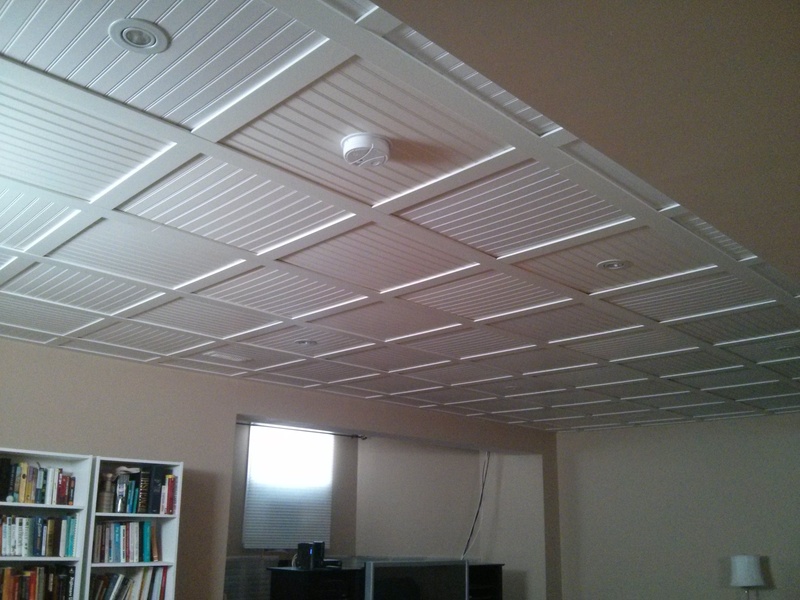 Styrofoam ceiling tiles are easy to install. Even it is the best choice for a novice at DIY. They provide a vast array of exquisite patterns that can adorn yourself. They can be painted easily if you think that the color does not suit your needs well. Styrofoam ceiling tiles usually cost an arm and a leg. They are prone to being burnt. When the house is on fire, this ceiling cover can trigger and worsen the fire. 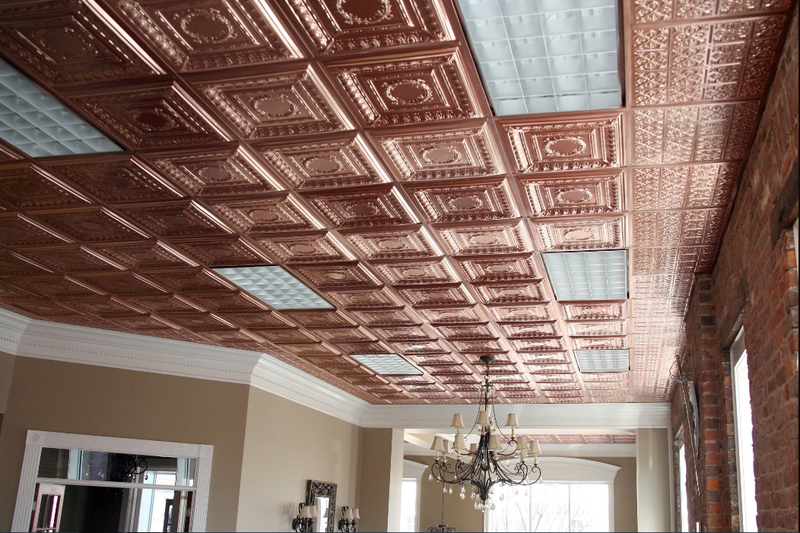 If you are looking for an affordable way to accentuate your room, metal ceiling tiles can be your best bet. Just take a look at this ceiling. It adds the touch of elegance through the rustic patterns. The color of the ceiling tiles fits the chandelier very well, adding romantic ambiance throughout the room. 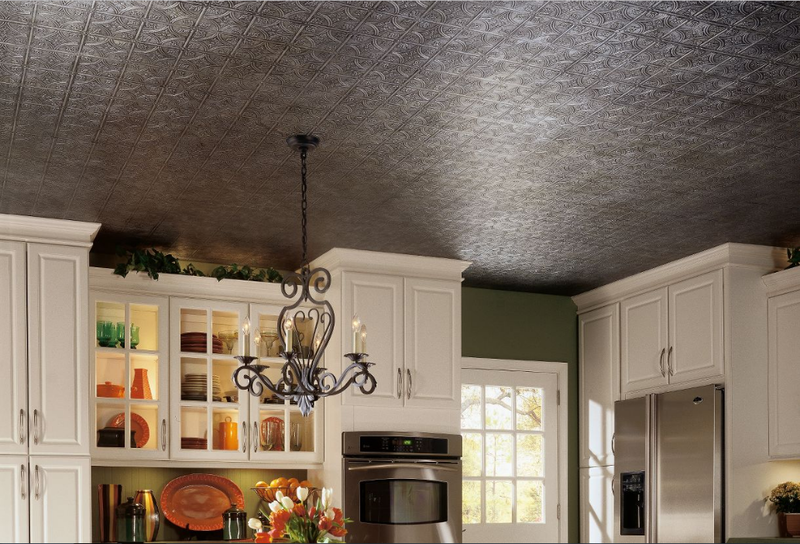 In addition to being affordable, metal ceiling tiles also offer a number of benefits. What makes them better than the other ceiling tiles including dropped ceilings is the durability. Since the tiles are made of metal, they are more durable. They do not crack, rot, and absorb moisture so that you can also install it in the bathroom. 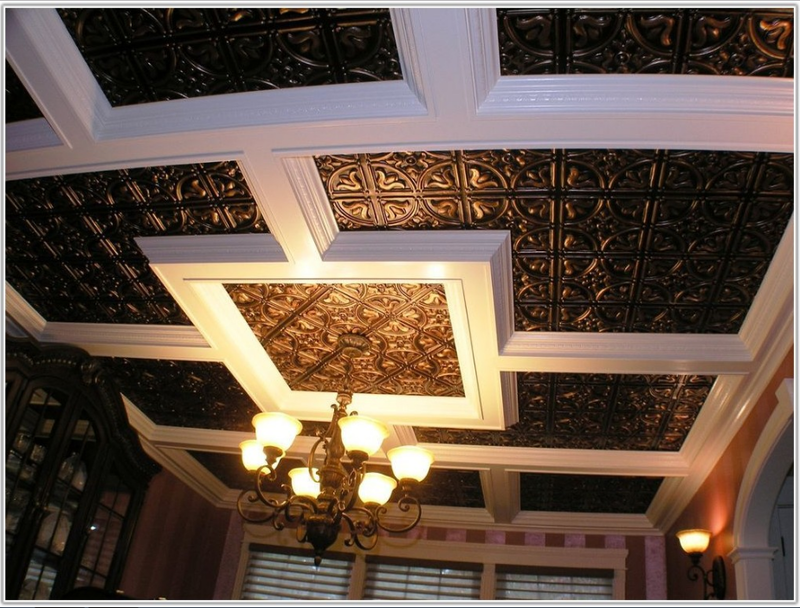 Metal ceiling tiles can be painted in any colors that you like. Unlike the Styrofoam ceiling tiles that are prone to being burned, metal ceilings are fire-resistant. Besides, they are also easy to install, making your DIY project enjoyable. 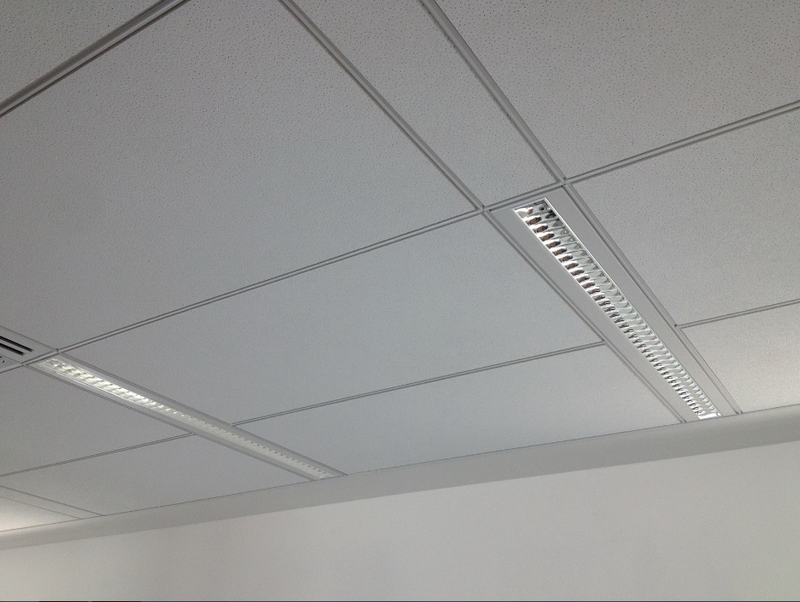 Dropped ceiling tiles placed in the light metal grids can conceal the flaw of the actual ceiling. Now take your dropped ceiling tiles to the next level by installing grid covers or grid moldings. They are similar to the moldings that you install for your baseboard. They cover the imperfections of the grids as well as accentuating the dropped ceiling, making it look more luxurious just like this brown dropped ceiling. The brown grids add an elegant touch to the room, making it look lavish. The grids also complement the moldings of the brown cupboard. Suspended ceiling has never failed to be a convenient way to embellish the rooms of your house. Since suspended ceiling tiles has various patterns and colors, they become more preferable. This ceiling give a sleek look to the minimalist look. The simple design complements the room very well without making the other furniture seem less important. The panels look like beadboard panels. Thus, these ceiling tiles will look great if you also install bead-board panels for the lower walls. Easy to install, even you can do it by yourself. They are easy to remove in case you are going to replace the tiles. An affordable way to jazz your room up. They are prone to deterioration. They are not really sturdy. Let’s add industrial look to your living room by installing copper ceiling just like what you usually find in steampunk style. These ceiling tiles are not the ordinary ones. Look at those embossed patterns! They look adorable and luxurious. They look more fabulous when the lighting shed some light on them, creating golden light that accentuate every single detail of the ceiling. The white grid moldings create visible border lines with contrasting color. The ceiling tiles consist of detail patterns that can amaze your guests. The ceiling injects the touch of luxury to your living room. The copper finish suits steampunk style a lot. The color of the grid moldings contrasts with the ceiling. It will be better if the moldings are painted dark brown or shades of brown to enhance the luxury-look of the ceiling. Wood ceiling panels look so wonderful in this room. Have you ever wondered whether they can be installed in your home and suit the room well? The good news is you can install them in any rooms of your house to create an artistic look. Wood ceiling panels are processed woods which are finely cut into sheets sizing 1 x 9 cm. After being cut, the remaining water in the wood panels is reduced by drying them in an oven. The reduction of the water is done to prevent further shrinkage that may happen during the installation. 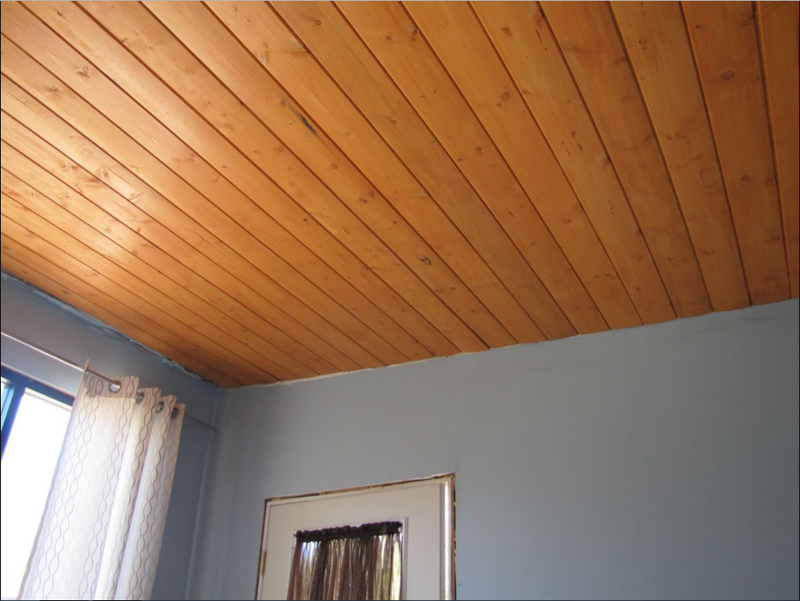 Wooden ceiling is usually painted natural wood to add a natural look to your house. Thus, it can be used in any houses. Unfortunately, the installation may be a bit difficult so that you will need to have them installed. 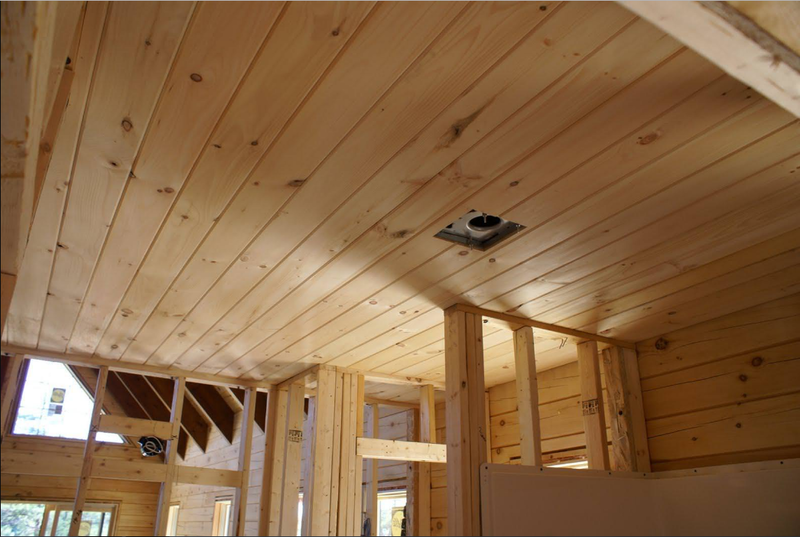 In addition to the tricky installation, wood ceiling panels may be more costly than gypsum ceiling. Sleek and simple. These white ceiling tiles can be a terrific adornment for any simple rooms and offices. 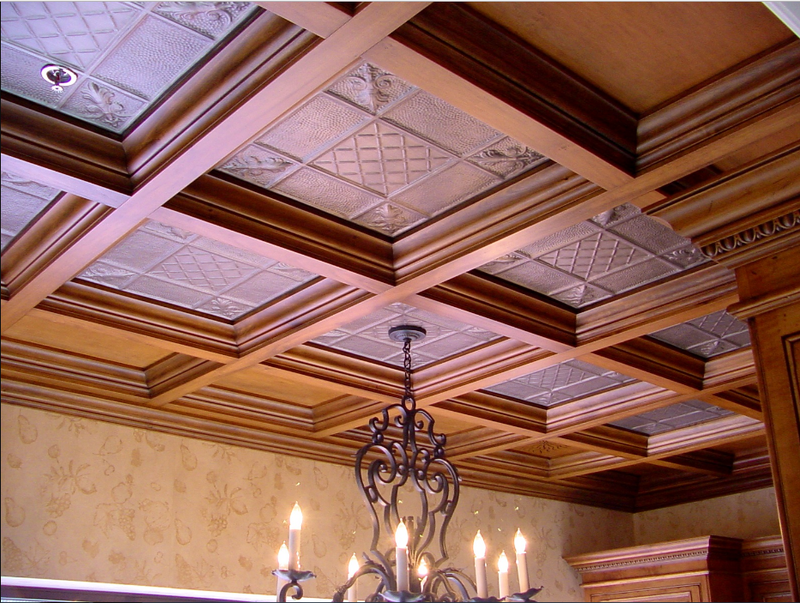 Although these ceiling tiles do not have any distinctive patterns, they still look amazing just the way they are. And, of course, being amazing does not mean that the tiles have to be overwhelmed by finely carved patterns or embossed patterns. In fact, flat and dull ceiling tiles can be awesome if you install them in the right places. These tiles will only suit modern houses and offices due to their simplicity. They will be less adorable if you install them in a house using Victorian or French country style. Are you looking for an easy way to add classic and natural look to your home? Try this one ── tongue and groove ceiling. Tongue and groove ceiling is actually wooden ceilings. They can be manufactured in wood veneers, MDF, and solid natural wood. Since they are made of woods, they provide a warm ambiance in the room which is very impressive for an all-natural-look house. Tongue and groove ceiling makes a great sound insulation. Besides, it can be stained or sealed in any colors of your choice so that it can complement the other colors of the furniture and fixtures in the room. Or, you can leave it that way for a more natural look. However, tongue and groove ceiling entails a drawback. The panels are affected by humidity and temperature. They can be damaged easily due to humidity. Gypsum ceiling is one of the most favorable ceilings because it provides a vast array of designs that will never fail to adorn and add luxurious touch to your room. This kind of ceiling is usually used in a simple room that uses sleek design. Just like this living room. This living room comprises of simple and natural colors such as brown, beige, white, and gold. All the furniture remains simple with bold colors and edgy shapes. 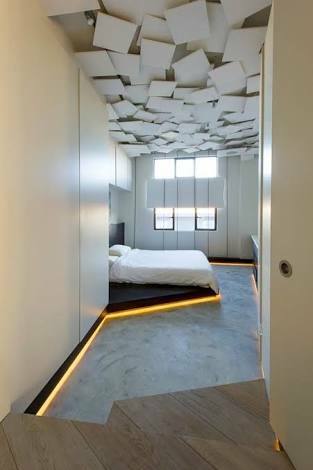 Therefore, rectangular gypsum ceiling is installed to accentuate the room. LED lightings are installed behind the suspended ceiling to create dramatic lightings. Many people prefer flat covered ceiling for modern room because they think flat ceiling provides sleek design that can spruce the room up. Why don’t you try to break the habit and see whether it works well in your room? These ceiling panels look like a disaster area. They are not well-organized and carelessly arranged as if an earthquake had stroke the house, creating a messy look to the ceiling instead of the flooring. But if you take a look at those messy suspended ceiling tiles, you will be amazed by how “messy” they are. They may be messy, but they are eminently cool. Your guests will be amazed by the conspicuous ceiling. The messy installation makes your room look cool. It will make your room look smaller, or even cramped. Those are some stylish and creative covered ceiling ideas. Some of them are DIY friendly, while some others need to be installed by a professional. 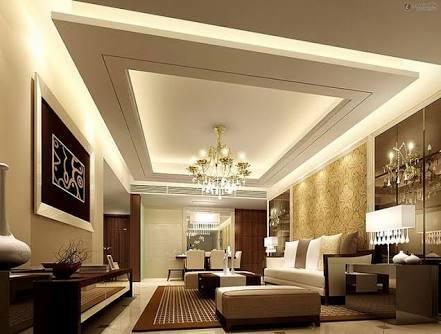 Before picking a false ceiling style, you need to consider your interior design first. For your safe bet, youmight want to install suspended ceiling with white and brown finish. « Anything About Inspirational Cape Cod House, Take a Look !